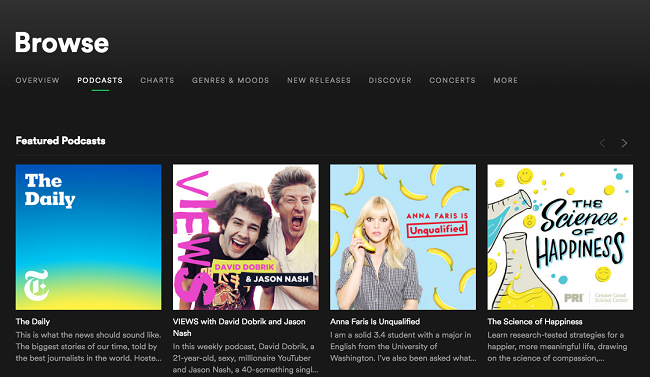 Spotify is very powerful, and you can not only listen to music songs or albums from Spotify, but also can listen to TV shows and Podcasts from Spotify. In addition, you can share your our podcast on Spotify and let you access to millions of Spotify listeners in 60 markets across desktop, Android and iOS devices. If you host your podcast with one of our aggregator partners, you can easily submit your podcast to Spotify in minutes. To find Podcast on Spotify, just open the app (make sure you have the most recent app update), click "Browse" and then click "Shows." As of now Spotify has hundreds of "audio shows," or as normal people call them, podcasts. If you are Spotify Premium users, there is no need to worry about downloading Spotify Podcast so as to play offline, because Spotify allows you to download them offline with DRM. If you are Spotify Free users, sorry for this, you can't free download Spotify podcasts offline, here we will recommend all-in-one Spotify Music downloader, Spotify Podcast downloader and Spotify DRM removal tool – Macsome Spotify Audio Converter Platinum. Macsome Spotify Audio Converter Platinum is designed to download and convert Spotify audio tracks including Spotify music songs and playlists and podcasts, and remove DRM from Spotify with fast conversion speed and 100% original quality output. After Spotify audio conversion, users can move and transfer Spotify audio files to Google Play, Apple Music, Google Home, Amazon Echo, Sony Walkman, Sony PSP, iRiver, VLC media player and so on easily and freely. Even you are only Spotify Free user, you can still free download all your Spotify music songs and playlists and podcasts as you like, and convert them to MP3, AAC, FLAC and WAV format. All the conversion can be finished easily, just including "Add – Set – Convert" three steps. It is also one professional Spotify podcast downloader, all the podcasts from Spotify, if you can play them on Spotify, you can also download them and convert them to MP3, AAC, FLAC or WAV. Help users to remove DRM from Spotify music. Convert Spotify songs, playlist, Podcast to MP3, AAC, FLAC or WAV. Keep ID3 tags for organizing the music library after conversion. Simple and easy intuitive interface. Fully support macOS 10.14 Mojave beta. Step 2. Drag and drop the podcast playlist from Spotify to Spotify Audio Converter Platinum. Open Spotify application, check podcast playlist you would like to convert, and then drag them to add window. If you want to convert the whole playlist, just click "OK" to load all the files to convert, or you can choose some one or more files to convert. Directly click setting button on the program interface to open the Preferences window. Now you can click "CONVERT" button to start conversion. After the conversion, all the podcasts you like has been downloaded to your Mac, and you can transfer them to wherever you like.